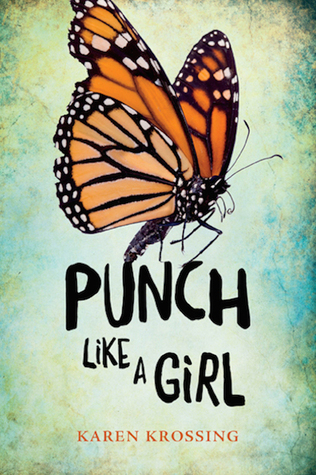 Punch Like a Girl is a teen novel told from the perspective of high school student Tori Wyatt. The book starts out with an attention-grabbing scene that describes Tori shaving her head. At this point, Krossing only provides a slight hint as to why she is doing it, leaving readers to pick up bits and pieces of the inciting event throughout the story. Besides altering her appearance, Tori’s attitude changes, as well, causing her friends and family to wonder why she has become so angry and aggressive. I can see teens really getting into this story in the beginning because it contains realistic characters and relationships, arguing among friends, instances of bullying, and an air of suspense surrounding Tori’s transformation. However, I can also see some teens losing interest during the scenes when Tori carries out community service hours as a volunteer at a shelter for abused women and children. I hope readers do not lose interest too often, though, because Tori experiences a lot of positive growth while volunteering, much to the credit of Casey, a little girl who inspires Tori to reveal the cause for her uncharacteristic behavior. For the most part, Tori’s actions seemed plausible given what happened to her, but I just kept thinking that her transformation was too much too fast. I understand that her anger and aggression were a result of bottling up what happened to her, but I didn’t fully buy that she wouldn’t have confided in her best friends, Alana and Jamarlo. ***POSSIBLE SPOILER*** I also found myself wondering why everyone in the story seemed to think Matt was such a great guy. Wouldn’t someone like him—someone who has issues with possessiveness and aggression—be kind of an all-around jerk? And the way he moved on so quickly from Tori to Melody seemed like a sign that he probably dated many girls before Tori, so surely Tori wasn’t the first he assaulted. This book would be a good classroom read for middle school students. **Thank you to Orca Book Publishers for providing me with an advanced reader copy of this book.